in their rising and falling…. Sunday morning, November first of this present year, eight minutes into the hike…the desert looked like…well, the desert as I have come to know it. 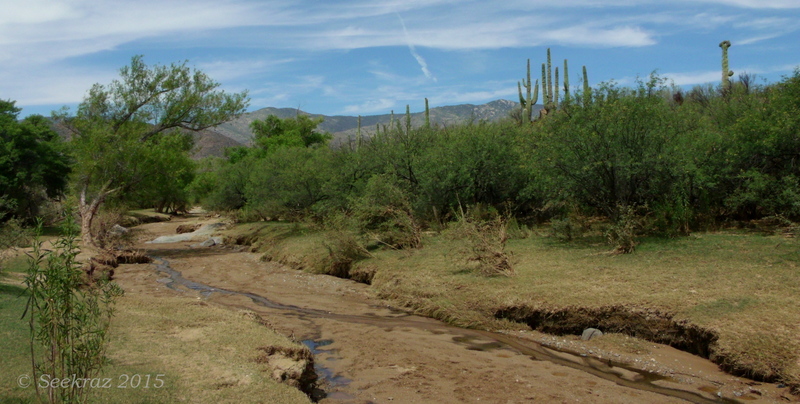 This stretch of the Sonora Desert has become rather familiar. I’ve been on this trail eight times now and have covered more than 40 of its 70-plus miles…and this stretch is the furthest south that I have been. There might be still one more track south of this trail-head, but being familiar with the area south of here, I doubt that I’ll head in that direction. The early twists and turns of the trail, and the crossing and re-crossing of dry water-ways or creek-beds had brought me up a slight rise and pressed on toward a flatter plain that would soon give way to other and more declivities and inclines as I progressed northward. 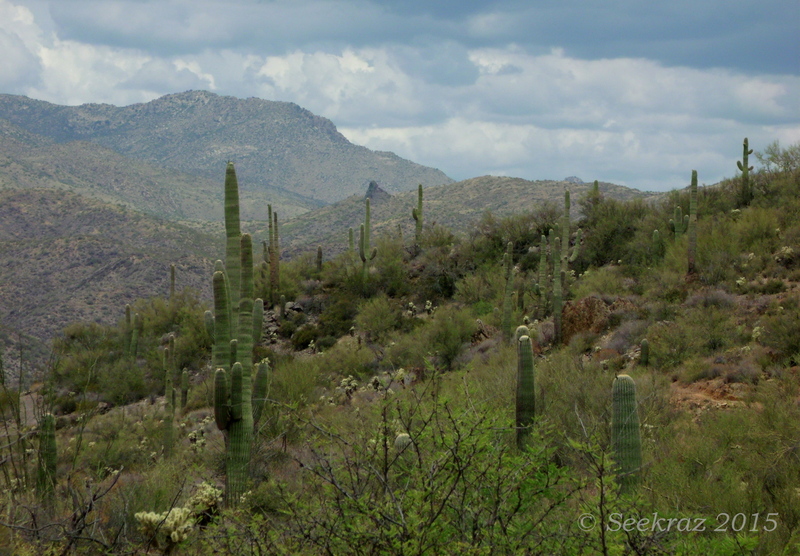 I had seen this particular Saguaro from further back and wondered if the trail would take me anywhere near it. If one were “looking for a sign” when lost out here in this desert wild, that someone might be tempted to view this as some kind of guide, or not…. I found it to be a significant landmark that, when coming from the other direction a few hours later, told me that I was very close to the end of my excursion. …and here it is again, but in a closer view. The living and the dead of the eternal desert…. 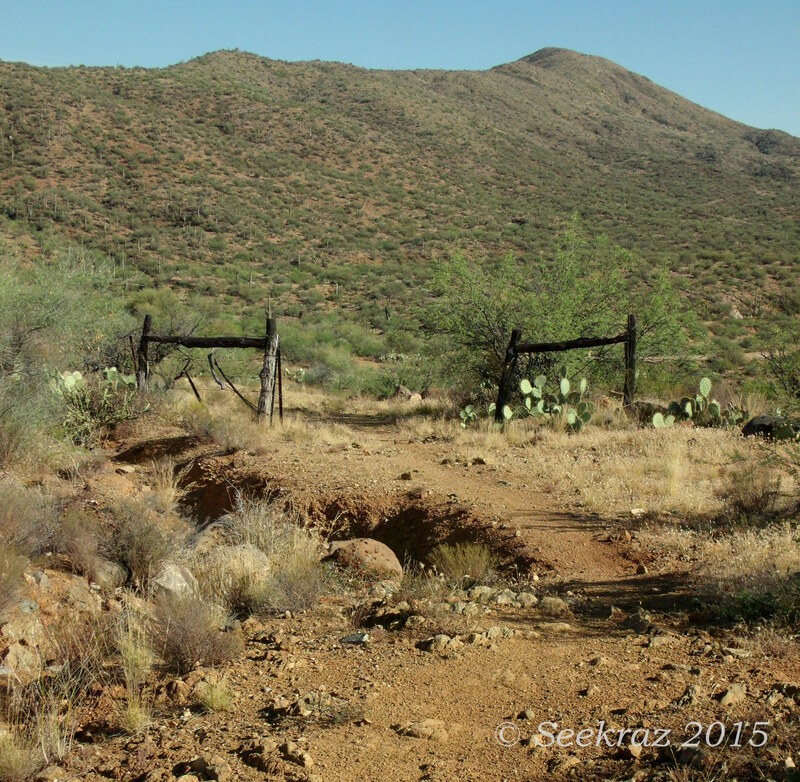 An old-school trail marker, faded by severe summer suns…. 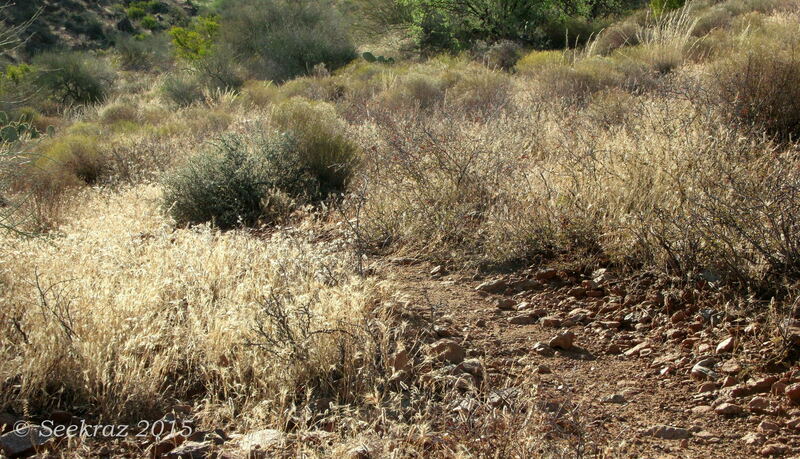 The trail was actually quite a bit lower than the surrounding desert in the below photo. I thought it provided a nice shrub-height perspective. 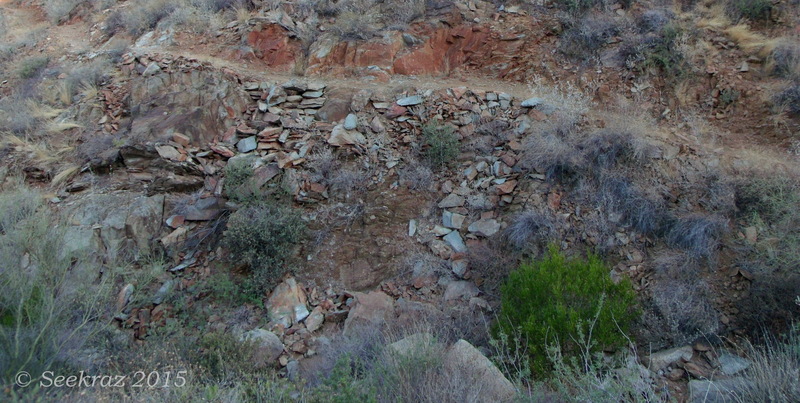 I thought there would be more to this section of the trail than there actually was. I came to the end much sooner than I thought I would and then stood there mid-trail thinking, “Is that all…really?” It felt much too early to head back to the truck and I wasn’t inclined to marching further on the already familiar track, so I headed off-trail to explore a couple of the minor peaks in the area. After reaching the top of one, I turned north and found a pleasant-enough view of the desert beyond…the trail toward the middle of the image is the one that would take me up toward the trail-head at Table Mesa Road. 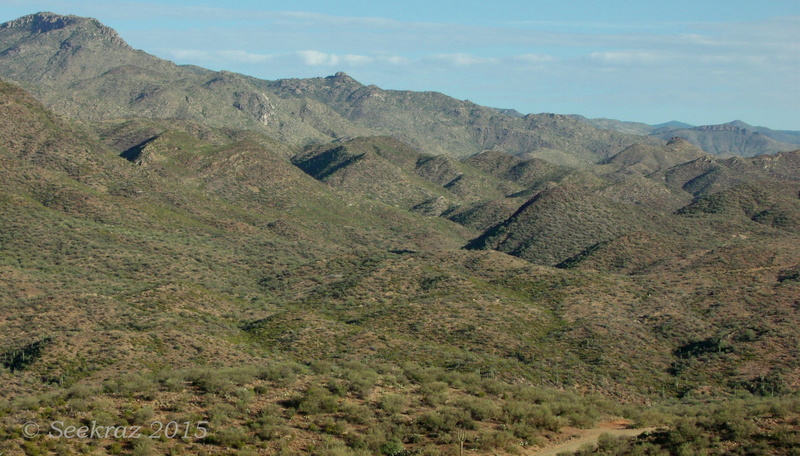 I’m still adjusting to this desert hiking and have to admit that I’m sometimes disappointed in the landscapes and panoramas…sometimes they seem so featureless…or plain…. Someone once said that it’s not what we look at, but what we see that’s important…so I press myself to look more closely in my search for beauty out here…I try to look at things with a fascinated, scientific mind sometimes, framing things within contexts of what I’ve read and learned about this type of landscape. And when looking much closer, I find cliffs and canyons covered in lichen….not literal cliffs and canyons, of course, but ground-level rocks that are covered in the moisture-dependent and fragile, yet enduring yellow lichen that appears with more frequency than one would expect out here. I notice, too, the varieties of plant life and the slope and angles of the land as it rises and falls in its relationship with, among other things, the comings and goings of water, the sculpting that occurs from the drainage and collecting of its seasonal rains…and then I wonder at how it looked when it was born, this volcano-riddled desert…..
From the top of another hill, I looked south and over the desert that pressed against roads and homes and saw the distant ridges that were clothed in the mists of commerce and civilization…smog…and was touched by the irony of this kind of “beauty” being the result of something so inherently unappealing. When I was taking a biology class in college several years ago, one of our assignments was to conduct a field study or observation of the plants growing on one slope and compare them with the vegetation found living on an opposite hillside. I had recollections of that experience when I was climbing the hill in the above image. I had just been on a different slope that was only dirt and rock with very little of anything growing there and no evidence of animal-life, and then visited this particular slope that was covered with wild grasses and Jojoba shrubs, desert trees and cacti, and had wild burro and rabbit droppings, as well as lizards and chipmunk/squirrel type creatures scurrying about….what a difference there was to be seen in the opposite extremes of the lay of the land……when looking closer. I don’t know the name of the tree in the above image, but it provided an uncommon and inviting shade as I was descending the last hilltop of my afternoon explorations. 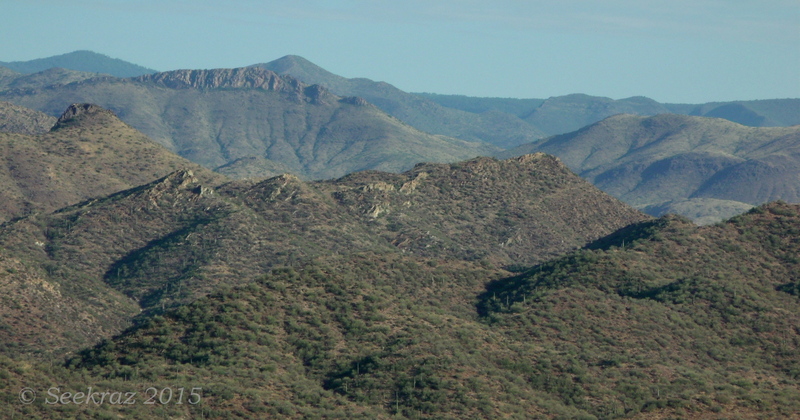 And lastly, an image that presents the contrast of near and far in the Arizona Sonora Desert…not very compelling when viewed from a distance, in my opinion, but strikingly beautiful and fascinating when experienced up close and personal. 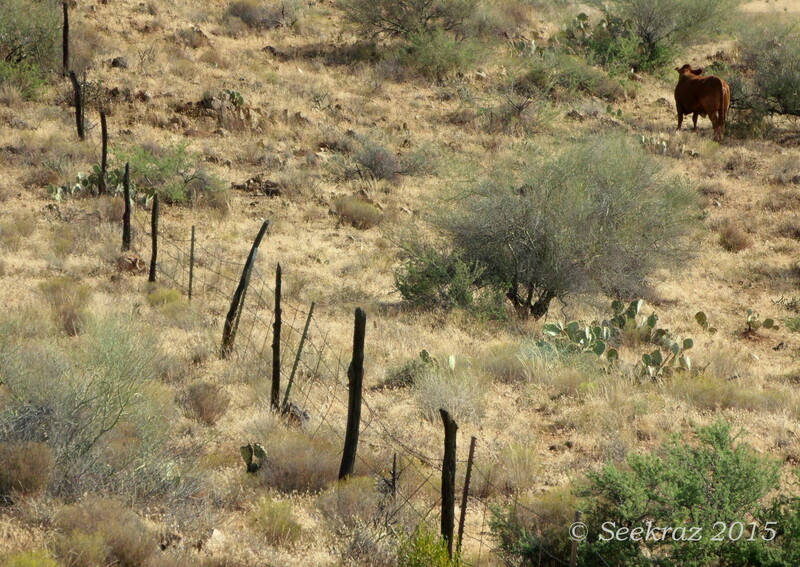 I had walked across the Sonoran plain on a man-made trail that led into and onto the edges of raw canyon walls. 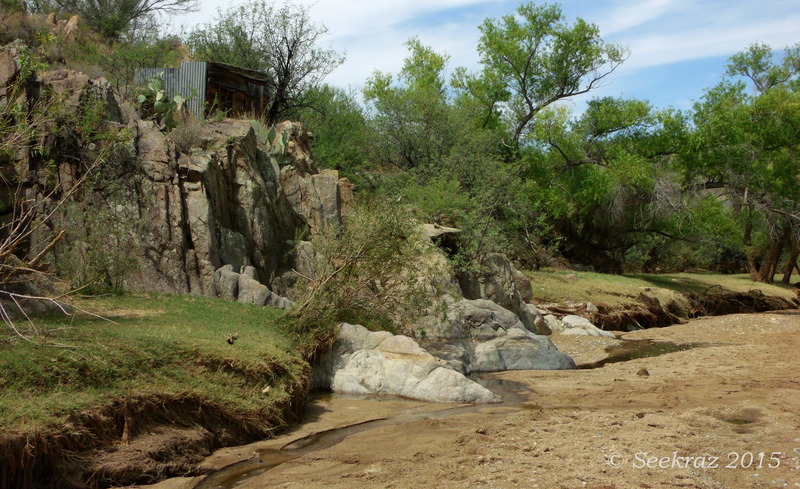 After reaching the pass at the top, I found only cairns and footsteps that led into the natural trail of a watercourse that had been carved through the land and literal rock by eons of desert rains and their accompanying floods. The crispness of the morning air was gone with the rising and warming sun, but the unexpected bright orange of Fall’s changing colors quickly reminded me that the nights were indeed cold up here…in the White Tank Mountains. Abstract like thoughts and imaginings…the eternal desert changes and renews itself with the close passing of time…. The high for the day was supposed to be below 90 degrees…and there was a 50-60% chance of rain in the area starting around 11:00. The image is from two minutes shy of noon and I had yet to feel a drop of rain…and I wouldn’t for the next hour that it took me to make it back to the truck…but it was beautiful in its potential. Sometimes that has to be good enough…. For the past several years, I have used the website “Weather Underground” to follow the temperatures and weather patterns in the places I have lived…and to even look back nostalgically at places where I used to live to see how things are going there, as well. Two weeks ago I was watching the temps for Black Canyon City and hoping the high temperatures for the coming weekend would be lower than they were a couple of weeks earlier when I was out in the murderous heat and so desperately needed a Coke after my hike. I was in luck…the high for this past Sunday was supposed to be under 100 degrees, which meant that I could get out on the trail around 6:00 or 6:30 in the morning, have a nice long hike, and still make it back to the truck before the heat became too ugly. 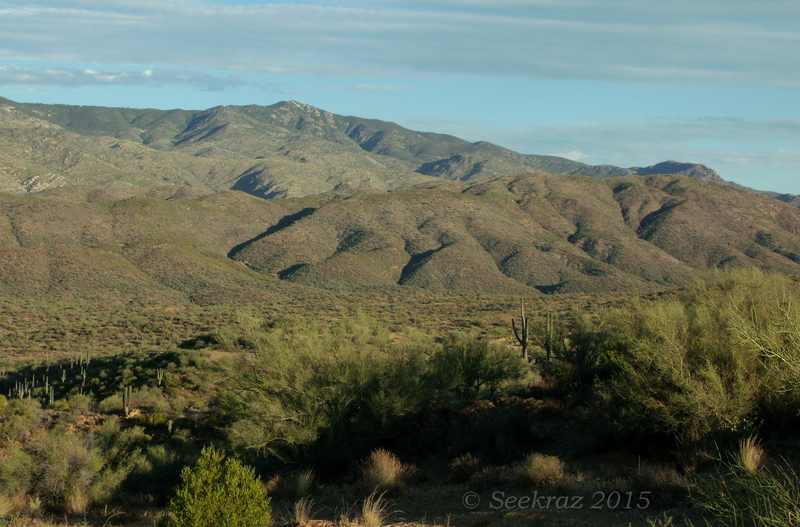 This first image is of the Bradshaw Mountains, looking northwest at 6:25 am. 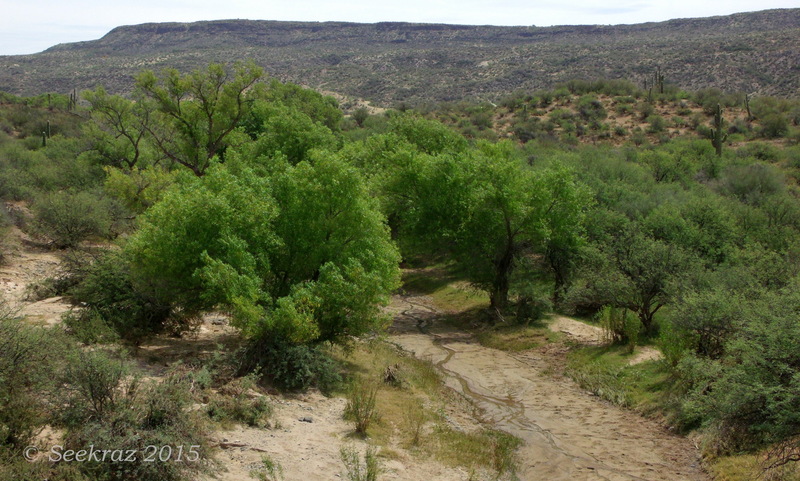 The larger trees in the foreground are a variety of Palo Verde. 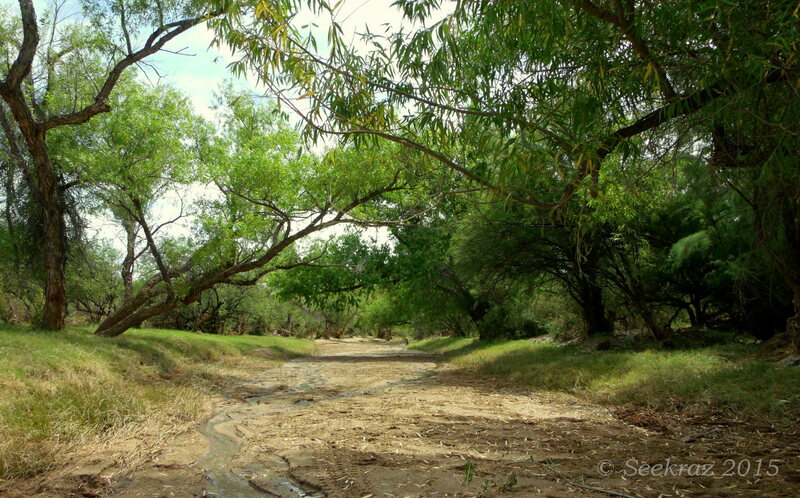 During drought conditions, the trees lose their leaves and are still able to perform photosynthesis through the chlorophyll in the “bark” or exterior covering of all of the branches and trunk…. 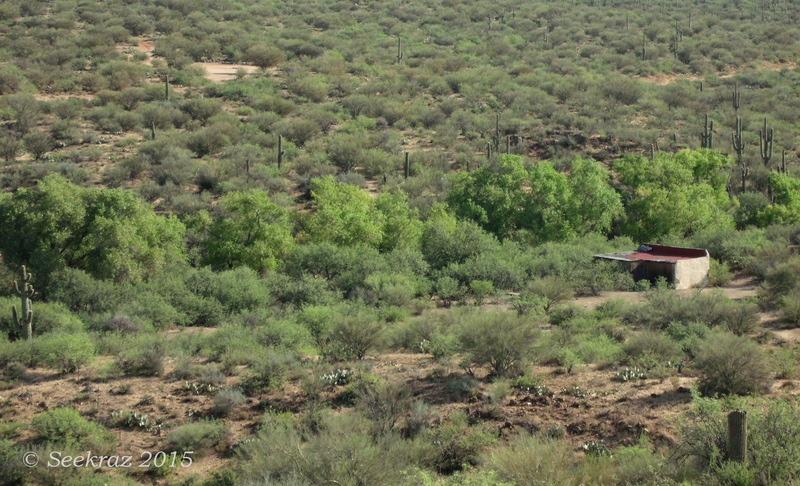 You can also see several Saguaro cacti in the background…. 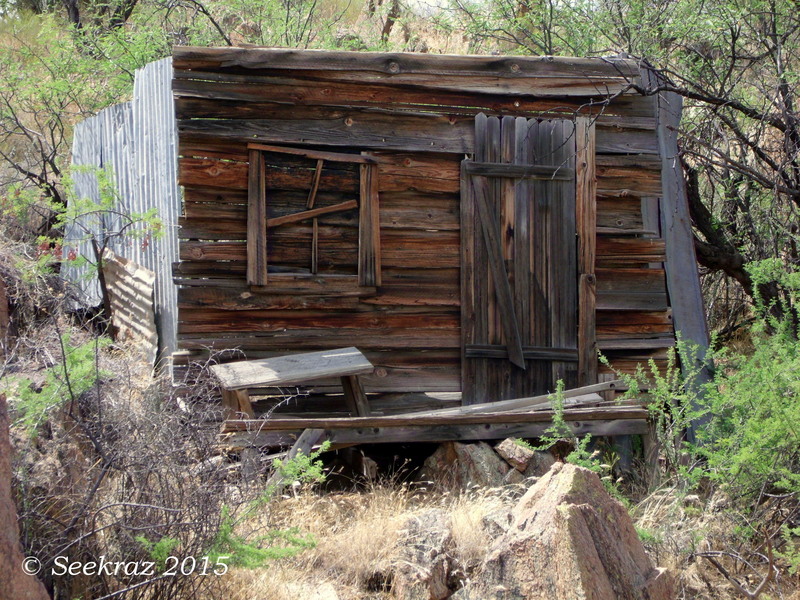 Most of my hiking in recent months has been along the Black Canyon Trail. I’ve been out six times and have covered nearly half of the 78 mile long trail. If you care to look at a map, find Interstate 17 (I-17) going north from the Carefree Highway at the extreme north end of Phoenix, and imagine a trail running in the desert just west of the interstate and east of the mountains further west…and follow that space northward for about 80 winding and curving miles up toward the Prescott National Forest. 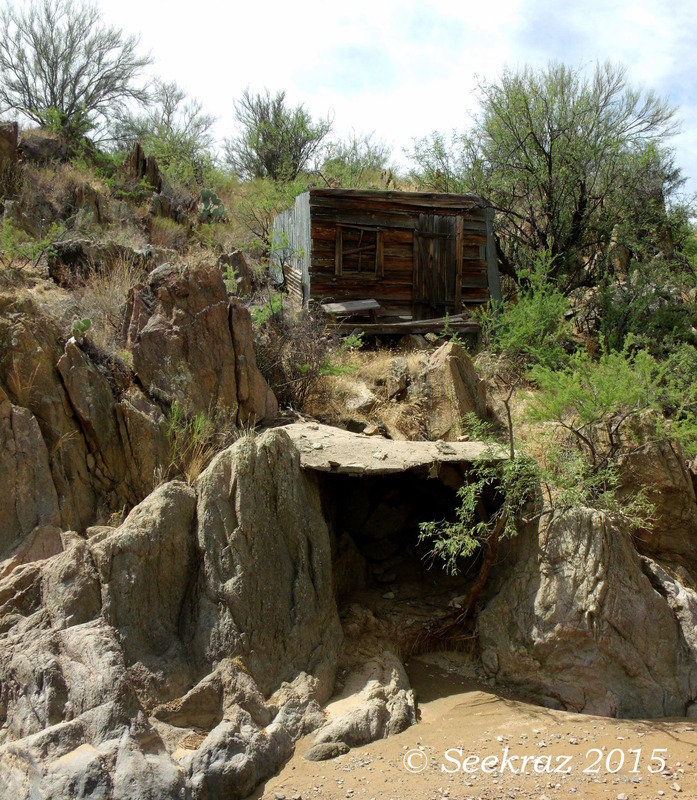 The portion of trail featured in this post is what can be found heading north from Bumble Bee Road, about 25 miles north of Phoenix. 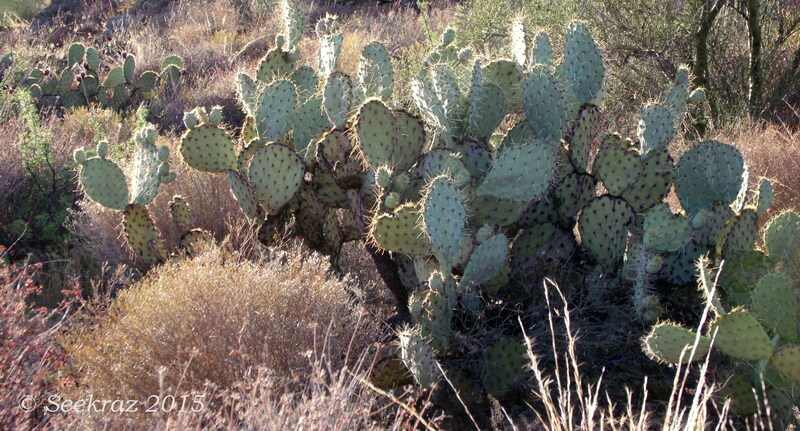 This second image is primarily of the “Pancake Prickly Pear” cacti and the dried wild grasses common to this area. 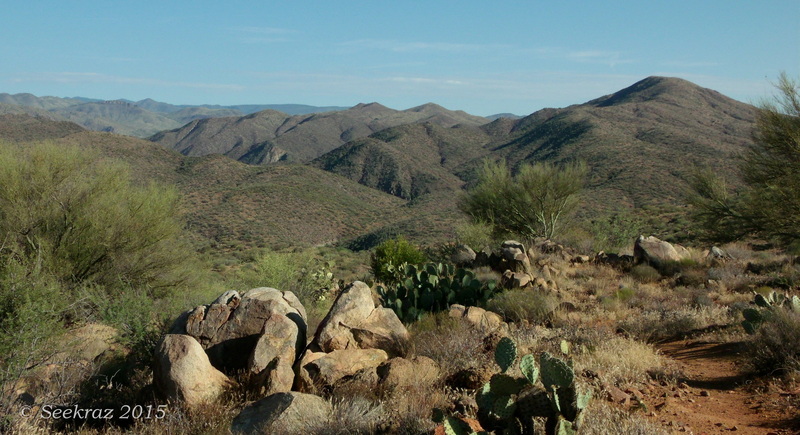 If you’ve ever driven that same interstate north from Phoenix and remember seeing a rest-stop sign for “Sunset Point,” and you stopped to look west at the huge, folding and flowing mountains, this hike took place on the stretch of trail just west from that Point. The first part of the hike was mainly in the shade, as the trail followed the contours of the west facing side of the hills and was situated far enough below the ridge-line that I was out of the sun for quite a while. It’s been a while since I shared multiple photos as single images, instead of presenting them in the “gallery” form, but I thought the photographs from this hike would be easier to appreciate in this larger form…so here they are, placed in chronological order and covering the first two and a half hours of the hike. There will be a couple of other posts in which I share groups of photos from particular stopping-places along the trail. These “desert hills” and mountains are quite different than the ones I hiked for the last few years, but they are still inviting…and tempting me to go off-trail to explore the draws and ridges that we can see off in the distance. I won’t likely do that until the temperatures are much lower, however, just in case some “unplanned” event occurs and I’m out there for longer than I had planned to be. 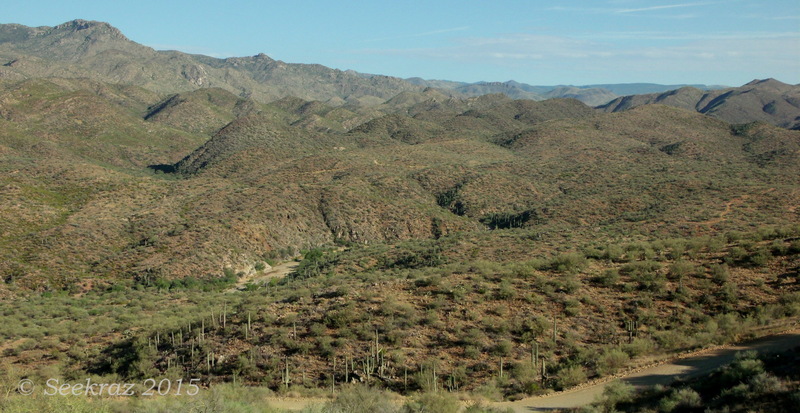 In the below photo, you can see an unpaved portion of Bumble Bee Road in the lower right corner, a couple of hiking trails further in the distance, and then a section of what might be the Agua Fria River bed in the area just left of center. 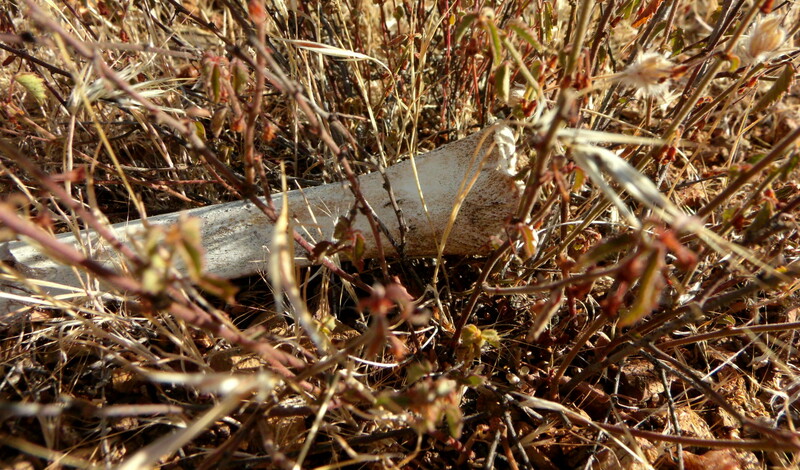 I had knelt to take some closer shots of Prickly Pear cactus fruit and saw this single piece of bone lying nearby. A quick search of the area failed to reveal any other bones, so this one must have been carried away and left here when the predator or scavenger was finished with it. At just past 7:30 am, the sun was sufficiently over the ridge to highlight the shrubs and grasses along the trail in the next photo. This one, right here, is where peace comes out on the desert’s trail, to me anyway…I love this image, this piece and the broader whole that it represents…the light, the smell, the quiet whisper of the morning breeze among the branches and grass, the un-nameable feeling that comes with being right here…is wonderful, and compelling, and alluring, and causes me to go out into the unpleasant heat that I know is quickly approaching, so that I can be here on a trail like this one. I would prefer temperatures in the 60s or 70s, but it was far from ugly-hot when I stopped to make this next photo. At only 7:45 am, it was still rather nice for desert hiking. Lines of demarcation, thine and mine, in the images above and below, but I was and am thankful that there was a gate or opening that allowed passage…so many places we’d like to go, it seems, have fences around them…. At 8:10 in the morning, I wondered how many mornings and afternoons these fence and gate posts have seen….their colors and textures speak of years…decades, even. The photograph below shows another view of an image that you have likely already seen…but I wanted to share it again within the context of the hike, moving from place to place, with the morning green of the desert hills and mountains, and the richer green, like a ribbon of life that thrives along a desert waterway, a sometimey waterway that likely runs below ground for most of the year, but rises again with the various seasons’ rains and floods. 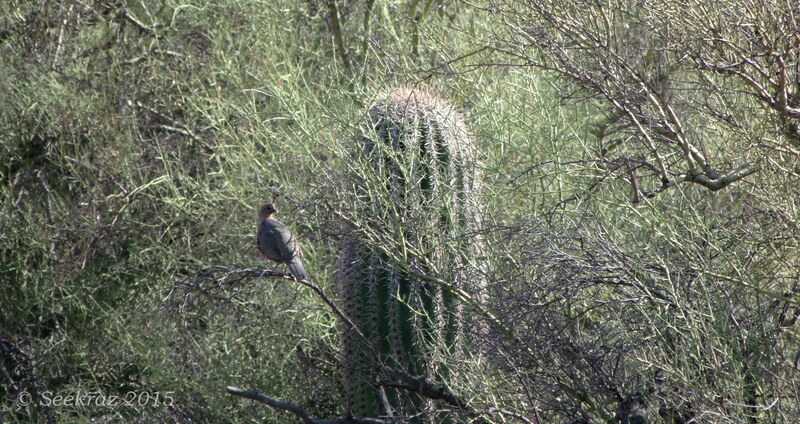 I usually become aware of the Gambel’s Quail when they burst from the underbrush as I pass too close to their hiding place, but I happened to spot this silent sentry as she sat alone in the tree some 20 or 30 yards off-trail. Even at this distance you can tell that this one is a female, as her head is missing the distinct color pattern that is common to the male. 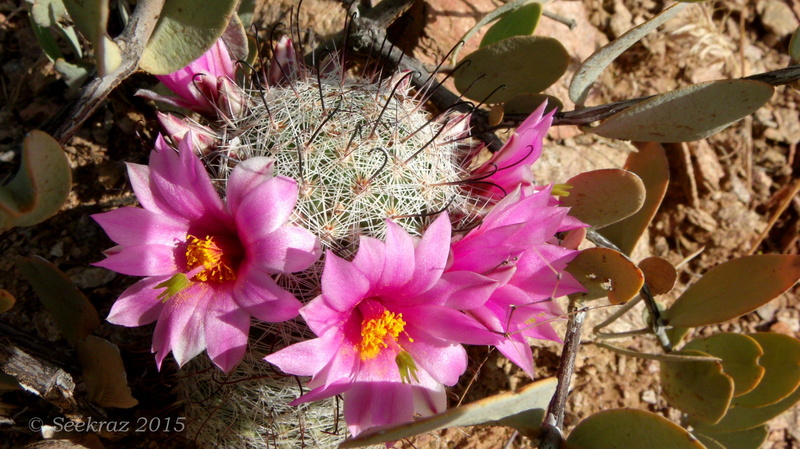 And lastly, several blooms on a Graham’s Pincushion cactus. I found several of these along the trail and, upon first seeing them, thought they were headbands that some hiker had lost along the way…they were so very bright, so vibrant in the middle of all the earth-tone, desert colors that surrounded me, they just seemed so unnatural and out of place. And if you’re interested, the flat, paddle-like leaves around this cactus belong to the Jojoba plant…. So…that was most of the hike, on the way out, anyway…and minus a couple of detours that I will share later. Thank you for visiting…and I hope you have a nice week. 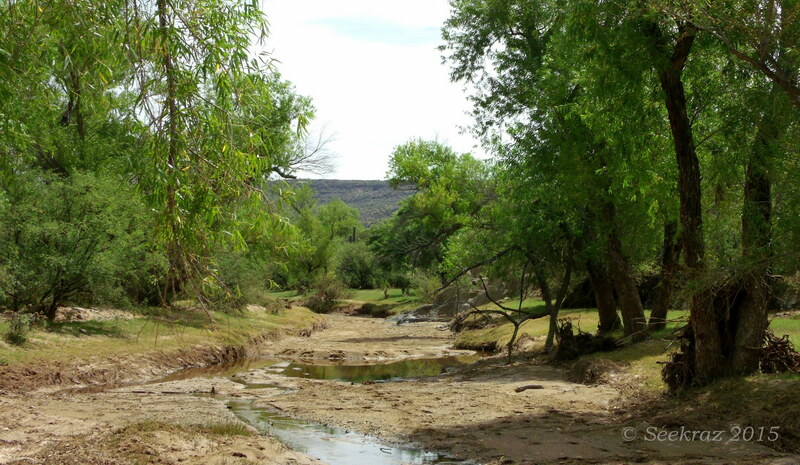 Hiking the Black Canyon Trail north from Table Mesa Road presents you with choices…at about 1.5 miles into the trek, you must decide to go east or west…either way brings you to the Agua Fria River. 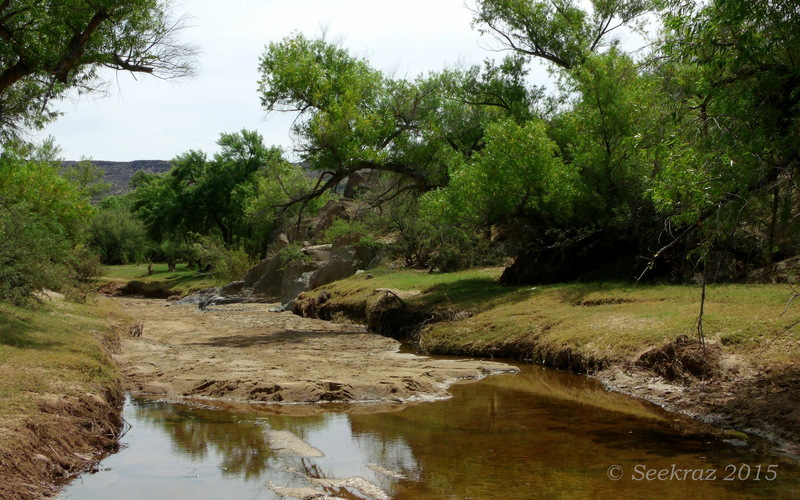 If you go west, you encounter the river sooner than if you go east…regardless of when you get there, it’s going to be “refreshing” in a way that cold, winter water is going to be refreshing on a hike through the Arizona desert in early February. There are many things to see out there, in that desert…things to look at…and things to really see. Sometimes perspective can blind us to what’s right in front of us…and other times, it reveals things that might be hidden…right in front of us.